A Regatta on the Grand Canal,” by Vincenzo Chilone. PARIS – In a quest that has lasted seven decades, a French Jewish family on Monday reclaimed a 10th painting from a valuable collection seized in World War II and systematically auctioned off. 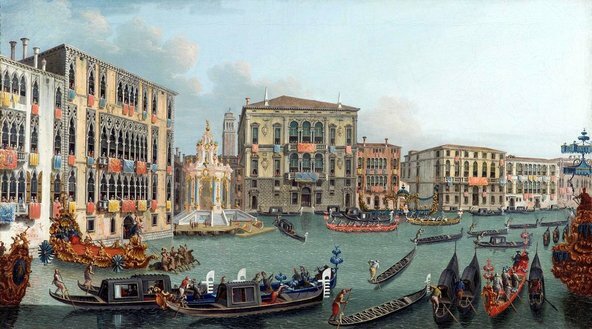 The missing 18th-century Italian painting, “A Regatta on the Grand Canal,” by Vincenzo Chilone, surfaced this year when the current Italian owners sought to sell the work, valued at about $90,000. It had belonged to Anna Jaffé, a childless British expatriate whose collection of 200 works, including pieces by Constable and Turner, was sold off in Nice in 1943. Once the Italian owners discovered the history and the family claim, “they were open-minded and understanding,” Alain Monteagle, a retired French history teacher and great-nephew of Ms. Jaffé, said. He is one of 11 heirs who together have recovered works from the Louvre and the Kimbell Art Museum in Fort Worth. The owners had bought the Chilone at a Sotheby’s auction in London in 1985 and had not realized its history, said Christopher Marinello, the chief executive of the Art Recovery Group, a company that was hired to oversee a restitution. Mr. Monteagle, representing the rest of his family, is pursuing the recovery of a Constable landscape from his great-aunt’s collection that now hangs at the Musée des Beaux-Arts in La Chaux-de–Fonds, Switzerland. The museum does not dispute that the painting was looted, but has refused to return it because museum officials argue that they accepted it as a donation in good faith from a wealthy local collector. Mr. Monteagle is organizing a nonprofit support group called, Avis, which means “warning,” to represent the descendants of victims whose art was looted in the war.